Today is a day set aside for rejoicing. It is that time of the year when we have come together to celebrate after hard work. The day the graduands might be telling themselves, well done after fulfilling a dream and aiming presently for higher heights. Years ago I also had the pleasure of feeling the way you do presently and on those occasions when graduation day came, I had butterflies inside me. Today it’s your turn and who can blame you. The only other occasion for most of us after this to experience butterflies inside us is when we are getting married. Therefore, some of you have experienced butterfly sensation twice whereas others have experienced it only once so far. As I join with your relatives, friends and well wishers to say “WELL DONE” I am required not to just end there but to give a synopsis of what happened during 2003 and to make projections for 2004/2005. v A total of twenty two students wrote the CSEC examinations in the various subject areas as follows: English Language (22 students), Mathematics (22 students), Office Procedures (10 students), Principles of Accounts (10 students), Principles of Business (10 students), Social Studies (11 students) and Information Technology (4 students). v We had 100% passes at the CSEC examinations in three subject areas – Principles of Accounts, Principles of Business, and Information Technology. There were two grade one passes in POA and one grade I pass in POB. Two grade two passes in Information Technology, one grade one, and five grade two passes in Office Procedures, one grade two pass in mathematics and two grade two passes in Social Studies. v Worthy of note are two things: (1) the information technology teacher took over that class from Mr. Solomon in the academic year 2003/2004; (2) Based on these results two of our students have gained entry into Queens College in the lower sixth form pursuing CAPE studies and another two are pursuing CAT examinations by attending classes in this regard. v We have now produced in video form the history of the College and our website in presently being updated. v In 2001 we introduced form three for students whom we felt could not cope with our CXC classes. Today it is with a sense of pride that I state that our second best graduating student and one that is presently attending QC came from this class. v We pride ourselves with the fact that our students do not need extra lessons – they have four contact hours per subject per week, therefore, when they would have spent two years with us, if they do not do well whenever they write CXC it is because they chose to do everything else than study for reasons best known to themselves. Additionally our Lecturers are very caring. v We now have a reference library and donation of books for this library is always welcomed. v We have two computer laboratories with a total of 26 computers. All of the computers in the number two laboratory were donated by Canadian Guyanese Mr. Horace De Barros through the instigation of the Canadian Embassy. Additionally, all the computers in laboratory number one are internet ready. Hence our computer students could do their research on the worldwide web free of charge. All other students can do so at a cost of $150 per hour and outsiders who are not students at a cost of $300 per hour. Therefore, today I am introducing this service to all who are here. Please recommend us to your friends and relatives. By the way, parents please note that we are now living in the computer age and as a result I ask you to ensure that all of your children become computer literate. Our fee in this regard is a mere $12,000 for our students and I urge you to take advantage of this fee. During the academic year 2004/2005 more emphasis would be placed on income generation. 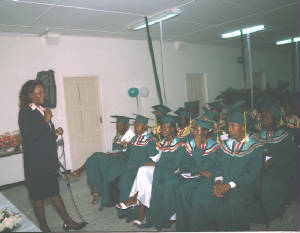 Additionally plans are in train for the College to offer CAPE classes to our graduates and the general public. All of you who are graduating today with up to grade three passes and above could make a note of this since you must realize that for you to become much more marketable you much further your studies so that you can be ahead of those with just CSEC passes. And by the way, those of you who hope to move on to university please note that through passing CAPE with up to grade two, you are granted exemptions at university. Discussions have started with some colleges and universities in the United States of America with regard to the College offering Associate Degree courses in collaboration with them. However, worthy of note is that income from our printing services increased by more than 100% when compared to the year before. As I think about 2003/2004, I would like to express my gratitude to my staff, the Ministry of Education and all those who supported me during the year. Thanks also to the students who chose to do courses with KKCC, I hope that you were not disappointed and that you would recommend us to others. By the way, please take the discipline that was had from KKCC with you to the world of work. Do remember among other things, that there are dress codes for the world of work just as there was for school, I urge you to uphold those codes at all times and remember also that just as how the lecturers cared for you, we would like you to adopt that attitude – not only for work but also with all those that you meet along life’s pathway. I know that some of you have already been doing that and I encourage others to do that also. A WORD TO GRADUANDS, you have graduated from Kuru Kuru Cooperative College, you are yet to prove yourselves as worthy ambassadors of the school of knowledge. You have started on this trail and how well you do on it is dependent upon you. You have to be good listeners, you have to excel in all that you do, you have to keep dreaming and aiming for the stars. On your path to success, you might have pitfalls, remember however, that the race is not for the swift, but for he who endureth to the end. Behind every dark cloud is a silver lining. Keep aiming for the skies and even if you do not attain it the first time that you try, with faith and persistence it must be achieved. Your dreams today would be realities tomorrow. As long as you are alive, you must dream. As you dream ensure that they become realities. At times you would need help to get where you want to go but remember the ant – have you ever seen the ant working alone? Even if at first you see one ant, when it realizes that the job is too big for it to handle, it brings others to assist. Please ensure that you are like that ant and in so doing you are sure to succeed. Go forth and claim all that is in store for you by dreaming about it and making that dream become a reality. Thank you so much and may the Great Creator of the universe remain with you to guide you every step of the way until your dreams become realities. Good evening ladies and gentlemen, friends and family, teachers and administrator, thank you. 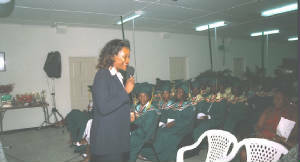 It is a tremendous honour to be the valedictorian of our graduating class of 2004. To my fellow classmates, we’ve made it. We’ve finally made it. We are graduating, congratulations. Congratulations not only to us graduates; for achieving excellence not only in our academics but in and out of school. Congratulations to our teachers, parents, friends, families and administrator. Our success is your success, for you have given us the freedom to dare, the courage to excel and our belief that we can achieve our best. You have been there for us with support and care; you had faith when we doubted ourselves. For all these things, we the class of 2004, Thank you. For some of us, these last few years went by so quickly. For others it seemed like an eternity. Personally, I find it hard to believe that it has been five years since the start of my undergraduate career. 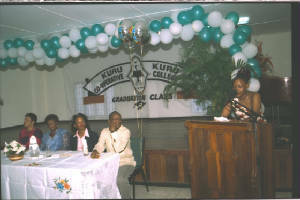 After attending the Brickdam Secondary School from 1999 to 2002, I attended the Kuru Kuru Co-operative College for two years to complete my secondary education and that is where I wrote six (6) subjects at the Caribbean Secondary Education Certificate (CSEC) exam and gained two (2) grade ones’, three (3) grade twos’ and a grade three (3). On receiving my results I was very afraid and doubtful about whether I had done well or not but still I kept the faith and it was faith that I really had when I opened my examination results. On seeing my grades I was very happy and pleased but most of all overwhelmed on what I had done in my exams. After being taught by so many wonderful teachers, it is now I realise that true teaching comes from within and that they had genuinely cared about us students and that they committed themselves to serve to the best of their abilities. I’ve always believed that teaching is the most challenging, yet rewarding profession in the world because you as a teacher have to make a tremendous difference in the lives of your students, who in turn, bring out the best in you. To those of you who have made a difference in our lives we say once more thank you. And while I’m up here, I’d like to thank the people who I’ve gotten to know over the past two years. Thank you for all the laughs we shared, I’ll never forget that. Most importantly thank you for your friendship. You have made a tremendous difference in my life and I know that I am a better person because of you. Let us keep each other in our thoughts and prayers and always remember the lessons that we learned from one another. Whatever you decide to do, remember that destiny is not a matter of choice. I would like to leave you with these simple words: thank you, goodbye and God richly bless you. Denise .A. 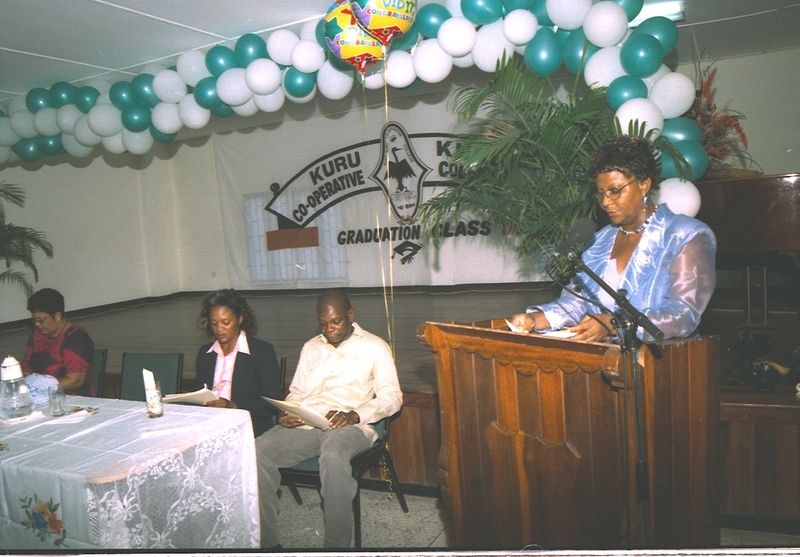 Beresford - Former Director of Guyana Training Agency gave the feature address at the graduation. With over ten years experience as an expert in administration, Mrs. Beresford is also a motivational speaker. Despite her active role as a mother of three young children she contributes to the development of women and young people within various communities. She is known for her involvement with leadership an Management skills for public and private sector organisation and has further utilise these skills in addressing young upcoming leaders of various service organisations (i.e. Rotaract and Jaycees). Members of the head table, distinguished guests, ladies and gentlemen, and graduands. 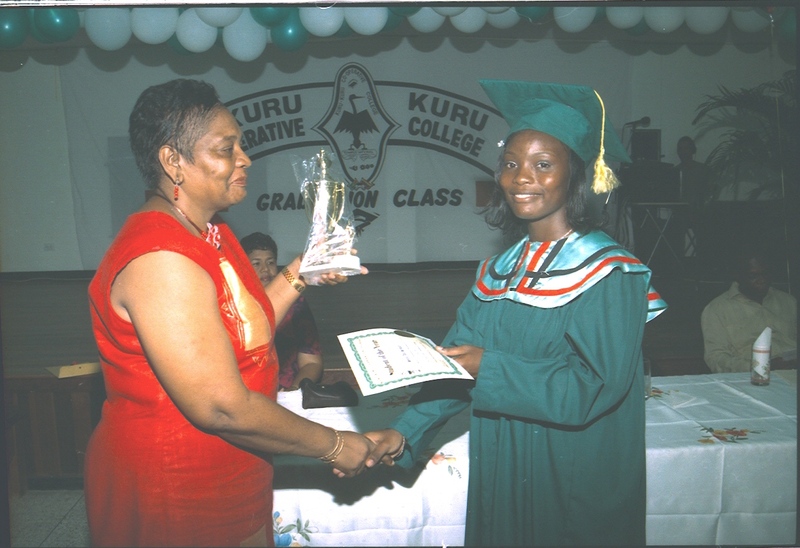 It is my pleasure to welcome you to our 22nd Graduation Exercise of the Kuru Kuru Co-operative College. I hope that by the time you leave here you will find the evenings proceedings most enjoyable. It is now my pleasure to introduce the chairman of theis afternoons proceedings. He's a devout Christian and family man. He's multi-disciplined since after leaving high school. 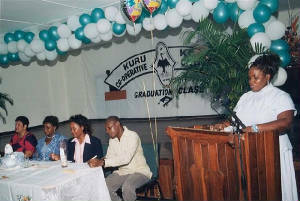 He attended the Guyana School of Agriculture and did a diploma course. After completing that course he worked for a number of years in this field, then branched into broadcasting. Most of us know him as a broadcaster. We are accustomed to hearing him on radio, hearing his voice in advertisements and such like. He loves communication so much that whenever he's called upon he imparts this knowledge to others. In this regard the students of Kuru Kuru Co-operative College have gained from his knowledge. Presently he's attached to the Canadian High Commission as their Communications expert. It gives me great pleasure to introduce to you my former Communication teacher, Mr. Frankie Bob-Semple.